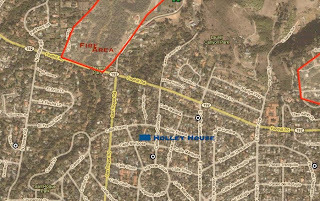 I was on a business trip Tuesday when I received a call that my house was in a mandatory evacuation zone as a result of the Jesusita Fire. I hadn't prepared for this, although I said I would when the Tea Fire hit Santa Barbara just six months ago. I have amazing neighbors who grabbed my cat, but I felt incredibly helpless when I returned to Santa Barbara that night in my high heels and business suit — not exactly disaster attire. Thankfully there was a window of time Thursday morning when I was allowed to go back to the house and grab some of my belongings and ditch the heels. The next few days were spent glued to the TV, internet and radio, desperate for information. Almost 30 percent of the town was evacuated so if you weren't evacuated you had someone who was staying with you. The calls, text messages and emails were constant, with people checking on your safety, offering to help in some way and sending prayers. The sense of community that rose up from the flames was deeply touching. 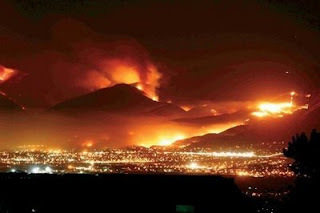 Thursday night was the real nail-biter, as the fires shot down San Roque Canyon and were threatening to jump Foothill Road/192 and take out my neighborhood. I am eternally grateful to the firefighters who took a stand at Steven's Park and held the line, risking their lives to protect strangers' homes. It's an understatement to say I was relieved to hear I still had a home the next morning. The fire got close, within a few hundred yards, but again I still had a house, which is sadly more than some people could say. Many of us were able to return to our homes on Saturday when the weather cooperated and the firefighters could finally get the upper hand. The landscape was decidedly different, though, as I walked through the embers in my backyard, looking toward the foothills. It was unnerving. All you could see were charred hillsides and some spots where houses stood just days ago. Eighty homes were destroyed and 8700 acres ravaged. But it could have been worse. Although exhausted after several sleepless nights, I was overcome with the desire to be with people drinking, eating and laughing. For me, those are the happy things you do in a home, my "security blanket," I guess. And I desperately needed that again to get past the harrowing experience we'd just gone through as a community. So we opened our house up to friends and neighbors to come together to celebrate our homecomings and breathe a collective sigh of relief. A wonderfully eclectic group gathered. And you could shut your eyes and actually feel the sense of camaraderie overflowing in the room. Going through a disaster has a strange way of bringing people together. It was actually one of my favorite evenings I've had in this house. One of the most surprising elements that night was when the Los Angeles NBC affiliate news van pulled up. Russ went outside to ask if they'd like something to eat or drink. They declined but asked if they could come in and shoot some interviews. They were putting together a segment on people who'd been evacuated and were returning home. I answered a few emails and text messages this morning from people asking, "Hey, did I just see you interviewed on the Today Show?" and then began the tedious yet emotional process of unpacking all my precious belongings I so hastily gathered just a few days earlier. I think most of us at one time or another have asked ourselves, "What would we grab if the house was on fire?" But when the time comes, it's funny what we actually choose to bring with us. For instance I brought my bills and a lint brush. God forbid I should fail to pay my credit card on time or be caught with wayward fibers on my black linen pants at the evacuee shelter. Bizarre choices, I agree, but I did manage to pull myself together enough to grab some truly valuable and irreplaceable items. One of them was my first recipe book. My mom gave it to me for Christmas when I was a junior in high school after I started to take an interest in cooking. It is just one of thousands of gestures my parents made to encourage me to embrace the things that made me happy in life. I enjoyed thumbing through it and seeing how narrow my eating and subsequent cooking habits where back then. Let's just say I was big on chicken. But what makes this book so special is that my mom took the time to include many of her recipes I love. Like her pound cake. It's so moist and fluffy even though it's dense like a traditional pound cake. I thought it would be fitting to bake it in her honor on Mother's Day. And I can honestly say I've never enjoyed cooking in my kitchen as much as I did today — so grateful to still have a home. Have all ingredients at room temperature and preheat oven to 325 degrees. Cream butter and sugar in large mixing bowl. Add eggs one at a time, beating well after each addition. Add flour, baking soda, sour cream and vanilla, mixing until thoroughly combined. Pour into a greased bundt cake pan or 2 loaf pans and bake for approximately 1 hour or until a toothpick inserted comes out clean. Cool on a wire rack and then turn out of pan.